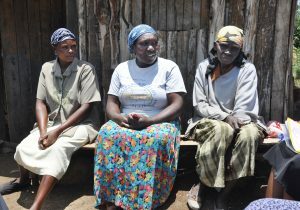 Ann (pictured right) lives alone on a small farm near the town of Nyeri. She has advanced breast cancer. Like many Kenyans, she has no money for surgery or chemotherapy. She relies on her daughter Grace (left) and her hospice community health volunteer Rachel (centre), for her care. The support Ann receives from the hospice and Rachel is invaluable to her. Rachel lives nearby and visits Ann regularly. She has been trained by the hospice to change dressings, help with morphine for pain relief, and to provide comfort and support for Ann and her daughter. Sadly, over 90 per cent of people in Kenya have no access to palliative care. Unable to afford treatment and with no palliative care, many die in pain and isolation. We are working with partners to change this. Please donate to support other like Ann.